You can also try, http://www.freeoutlookbackup.com/, a free tool, which helps you in taking backup of your Outlook Data (PST) file. Sign in as Local System Administrator or equivalent to install and use Outlook migration tool. 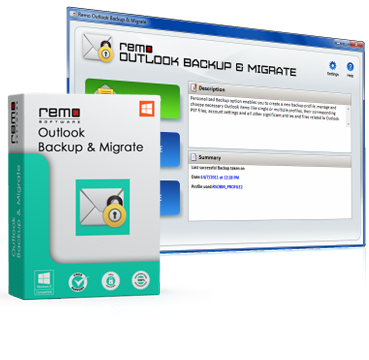 Migrate Outlook software is a simple email backup & migration tool that lets you backup & migrate Microsoft Outlook data with ease. You can use Smart Backup option to take backup of all Outlook data with a single click, or use Advanced Backup option where-in you have the option of selecting the Outlook items that you want to backup. The software also schedules backup of Microsoft Outlook on a regular basis & you get the option to password protect the backup file, preventing any misuse. You also have the option of migrating all your Outlook data from one PC to another i.e., you can move Outlook personal folders to new computer. USP of using Migrate Outlook is that you can migrate complete Outlook data including Outlook profile from one computer to another irrespective of any Microsoft Windows Operating System Versions as well as from Outlook Versions. The software also allows you to migrate Microsoft Outlook contacts from Outlook 2003 to Outlook 2007 or between any other versions. Every single individual opts to maintain a back up of the content or information that they find are important to them. Your Personal Storage Folder or the PST file contains almost all the information stored in Outlook like your emails, contacts, RSS feeds, notes, Junk emails etc. Sometimes your Sent Item folder or Inbox folder may contain important official mails and attachments which may be required later. When these folder reaches its maximum storage capacity, you are left behind with no option other than emptying it or deleting some unimportant emails. What if you end up deleting an important mail in a hurry? To be on a safer side, backing up the PST file will help you in recovering all those important emails which you might have accidentally deleted. Now its easier to create backup file of Outlook PST in a very hassle free manner. Migrate Outlook is highly recommended by industry experts and is widely preferred by customers for its superb performance. The software has simple to use interface, using which even a novice user can migrate Outlook PST file on different Windows operating systems. This application also facilitates you to migrate Outlook 2010 to new computer with utmost ease. How to Migrate from Outlook 2013 to Outlook 2016? How To Recover Deleted Emails From Outlook 2016?